Justice Brett Kavanaugh heard his first arguments on the Supreme Court this week after one of the most bitterly contested confirmation battles in American history. The Senate voted 50-48 to confirm Kavanaugh shortly after receiving the results of a limited FBI investigation into sexual assault allegations against him made by California research psychologist Christine Blasey Ford, who knew the judge in high school, and former Yale classmate Deborah Ramirez. Senators were allowed to review a single copy of the report inside a secure room on Capitol Hill. The results were enough to persuade undecided Republican Sens. Jeff Flake of Arizona and Susan Collins of Maine to cast their vote for Kavanaugh, as well as Joe Manchin III of West Virginia, the only Democrat to vote “yes.” The vote, which took place amid screams of “Shame!” from protesters in the gallery, was the narrowest confirmation vote since 1881. Conservatives have pulled off a “judicial coup,” said E.J. Dionne Jr. in The Washington Post. First, Republicans stole a court seat from President Barack Obama to fill it with the hard-right Justice Neil Gorsuch. Then they rammed through Kavanaugh’s confirmation with a bare majority of senators representing just 44 percent of the population. 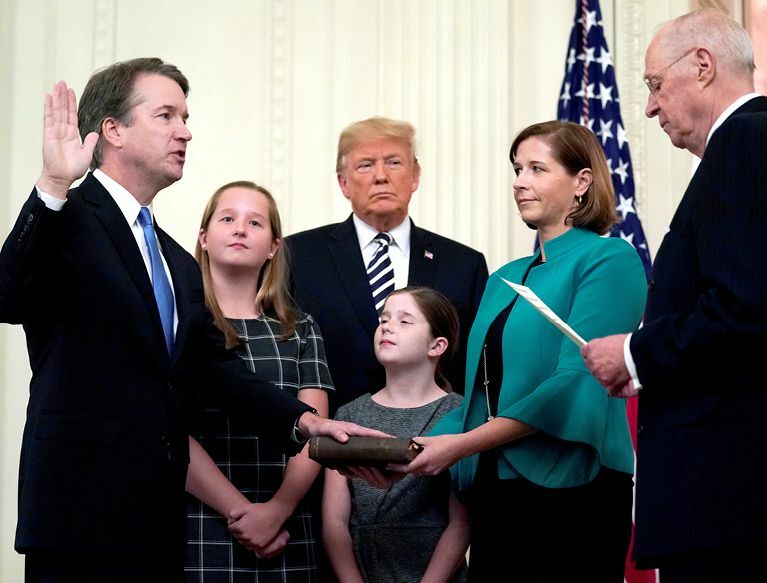 Such bare-knuckled tactics mean conservatives now have a solid 5-4 majority that may endure for decades, with four of their justices appointed by presidents who lost the popular vote. When Democrats regain power, they should seriously consider expanding the size of the Supreme Court to appoint more liberal justices. If Republicans can engage in ruthless “court packing” to achieve ideological goals, so can Democrats. So much for those precious “norms” liberals claim to care so much about, said David Harsanyi in TheFederalist.com. The Senate held hearings in which both parties were able to question Kavanaugh and his accuser. Republicans even assented to additional hearings and an FBI investigation to address the leaked allegations against him, even though they were largely unsubstantiated. Then the Senate voted, and Kavanaugh got a majority of votes. The system worked, but “according to liberals, every conservative-run institution is illegitimate.” Now, Democrats are complaining they somehow didn’t fight “hard enough” to defeat Kavanaugh. After the scurrilous tactics we’ve just witnessed, I’d hate to see what real fighting looks like. “How do I explain Justice Kavanaugh to my daughters?” asked Jennifer Weiner in The New York Times. Watching wrenching testimony from Blasey Ford was tough enough, but Trump and Republicans rubbed salt in the wound by turning Kavanaugh’s swearing-in ceremony into a “victory lap.” GOP Sen. John Cornyn even tweeted a picture of a celebratory glass of champagne with the hashtag #BeersforBrett. It’s a sickening reminder that for many men, “women’s suffering is a joke.” Our cultural divide has never felt wider, said David French in TheAtlantic.com. While liberals saw another privileged white man “grasping for power,” conservatives saw a falsely accused husband, father, and esteemed judge “fighting for his family, for his very honor.” This ugly fight opened wounds that won’t easily heal.